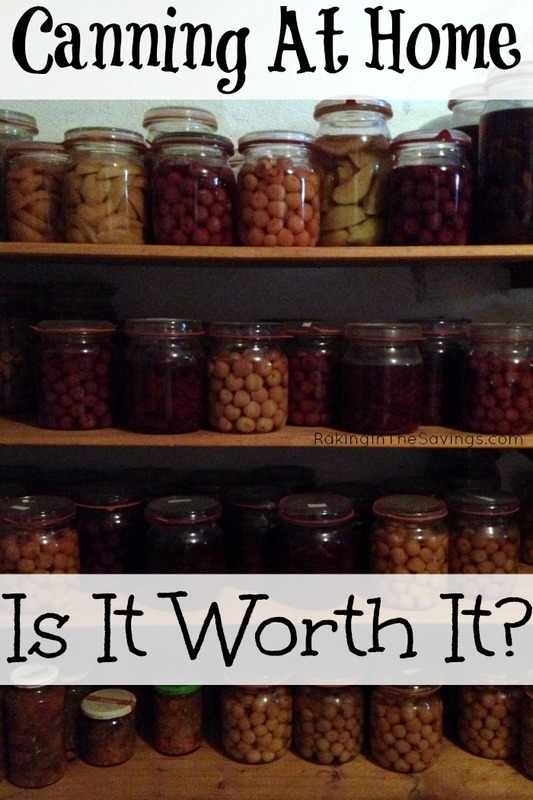 Canning Your Own Food: Is It Worth It? Many people want to can their own food but get overwhelmed when they start looking into it & want to know if canning your own food is worth it. It can seem like a huge expense to get started, but can save you a lot of money in the long run. Plus, you’ll know exactly what you are eating and can adjust to your own preferences! When you first start canning, like most new things, you will spend more time doing it. After a few canning sessions, you’ll be shocked at how little time you actually spend in the kitchen! Canning is a safe and effective way to store food by sealing the food in jars and heating them to let out any air, preventing bacteria from growing and spoiling your food. Before you get started, you need to decide which canning method you are going to use. Water bath canning (covering the jars with water and boiling) works best for fruit, pickling, and canning preserves. Oven & dry canning are reserved for dry goods only. Pressure canning is great for meat, veggies, and some fish. Oven canning is the cheapest one to get started on. All you need are canning jars, dry goods (think flour and other grains, and dehydrated foods), and an oven. There is a lot controversy over oven canning so many people choose not to use this method at all, so we aren’t going to teach you how to do it today! If you are just wanting to make sure bugs don’t get in your flour, try putting in an open stick of Wrigley’s Doublemint gum. It helps repel bugs and doesn’t change the flavor at all! Dry canning is similar to oven canning. It’s only used for dry goods (less than 10% moisture) but you don’t use an oven. Instead you use oxygen absorbers to stop bacteria from growing. I typically see this done with items that stay good for very long periods of time, but haven’t tried it myself. Water bath canning & pressure canning are the only methods endorsed by the USDA and those are the two I stick to. Water bath canning is done by submerging closed jars in a special HUGE pot. These pots come with a lid and a special rack that makes it easy to add and remove the jars safely. If you want to can meat, fish, or low-acidic foods, you’ll need a pressure canner like the one above. They have a steam-tight lid and a special gage. Although pressure canners can be a little expensive (water bath canners go on sale for about $20 this time of year), it is a one-time expense. Canning is the most cost-effective way to make and store your own food. It’s even cheaper if you grow your own food, but many people buy organic produce/meat to can. Picking up produce from your local farmer’s market is a great way to support local farmers and is normally cheaper than buying organic produce from the market. While canning can seem like a time-consuming process, once you are done you can have an entire season’s worth of canned produce and meat that is ready with little effort at dinner time! For many, the benefits from canning your own food outweigh the time and initial expense! Canning is definitely worth while for me. Jars and a pressure canner are a semi-one-time expense that I think saves money in the long run since I’m able to essentially knock out a whole bunch of cooking at one time, and it takes very little energy to heat up a can of food before serving. thank you for all of the tips. Thanks for linking up at Tell Me About It Tuesday. We hope you hop over and share with us again next week. and right now I have some pickles cooling on the counter that I canned just tonight. Thanks for sharing this at the #WWDParty. Hope you have a great weekend and thank you so much for sharing with Full Plate Thursday! Canning our homegrown produce was definitely worth it for our large family. I wish I still had the time to have a garden and can. I have never canned before, but have thought about it! This was a very helpful article! Next article: Mardi Gras Napkins Only $1.66 at Winco!